Are you looking for a pickup truck that promises power and toughness on the jobsite and a calm, collected ride for your day-to-day commute? 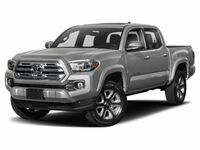 Look no further than the 2017 Toyota Tacoma in Hattiesburg, MS. An industry favorite in the midsize pickup truck segment, the Toyota Tacoma has emerged as a fan favorite at Toyota of Hattiesburg. 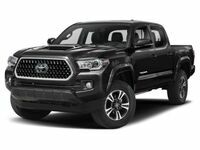 With a price tag that will not break the bank, a muscular style, an arsenal of innovative features and powerful engine options, the Toyota Tacoma checks all the boxes. 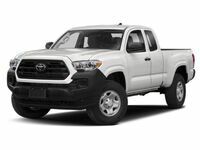 Available in six well-equipped trim levels – SR, SR5, TRD Sport, TRD Off-Road, Limited and TRD Pro – with a starting price of just $24,575, the 2017 Toyota Tacoma can be tailored to fit your needs. Access and Double Cab configurations pair with a 73.7-inch long bed or a 60.5-inch short bed – perfect for day-to-day chores or hard work on the jobsite. Inside the Toyota Tacoma cab, drivers will be greeted by a standard 6.1-inch Toyota Entune touchscreen display that provides access to Bluetooth capabilities, Siri® Eyes Free technology, a rearview camera and available navigation. Under the hood of the 2017 Toyota Tacoma in Hattiesburg, MS, car shoppers will have the choice between a fun-to-drive four-cylinder engine and a potent six-cylinder. 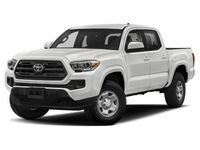 Entry-level Toyota Tacoma models employ a 159-horsepower 2.7-liter four-cylinder engine that is married to a six-speed automatic transmission to achieve 19 mpg in the city and 23 mpg on the highway. With a payload of 1,620 pounds and a towing capacity of 3,500 pounds, the four-cylinder Tacoma is an affordable and hard-working pickup truck. Drivers who require a little bit more muscle can upgrade to the new and improved 278-horsepower 3.5-liter V-6 engine that utilizes Toyota D-4S direct and port fuel injection to manufacture 265 pound-feet of torque. Paired with a six-speed automatic transmission, the power-packed Tacoma will still make 18 mpg in the city and 23 mpg on the highway. When equipped with the potent 3.5-liter power core and an available V6 Tow Package, the 2017 Toyota Tacoma will tow up to 6,800 pounds with ease. If you are looking for more than a work truck, the 2017 Toyota Tacoma promises unlimited thrills when you hit the trail. An available 4WDemand part-time four-wheel drive system with an electronic transfer case and Automatic Limited Slip Differential are tailor-made for mud-slingin' adventures. All-terrain thrills are taken to another level with an available Toyota Multi-Terrain Select system, a Locking Rear Differential and Crawl Control. Drivers in search of extreme thrills can opt for the trail-rated Tacoma TRD Pro that features a distinct TRD style, a TRD-tuned lift kit, a TRD-tuned suspension, FOX 2.5-inch Internal Bypass shocks, Rigid Industries® LED foglights and much more. Visit Toyota of Hattiesburg today to get behind the wheel of the 2017 Toyota Tacoma! Interested in a 2017 Toyota Tacoma?